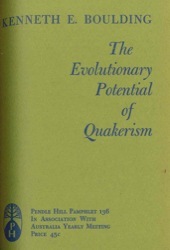 An economist sees Quakerism as a evolutionary mutation from the main line of Christian development and suggests the next stage in its development is intellectual. Kenneth Boulding was born in 1910 in Liverpool, England. Raised a Methodist, he joined the Religious Society of Friends when he was an undergraduate at Oxford. Starting as a chemist, he went on to become an economist, beginning studies at the University of Chicago in 1932. He became a citizen of the United States in 1937. In 1941 he married Elise Biorn Hansen; they had five children and sixteen grandchildren. From the beginning, Kenneth and Elise were central to the peace research movement and active in many Friends Meetings and organizations. Kenneth Boulding taught in many universities, published thirty-five books and served as president of the American Economics Association, the International Peace Studies Association, the Society for General Systems Research and the American Association for the Advancement of Science. He was also a noted Quaker poet, composing There is a Spirit: The Nayler Sonnets (PHP #337) and Sonnets from the Interior Life. He wrote poetry until his last days; Pendle Hill published his most recent poems in the 1994 compilation Sonnets from Later Life: 1981-1993. Kenneth Boulding died in 1993.